Death toll in Zimbabwe cyclone rises to 96 - SABC News - Breaking news, special reports, world, business, sport coverage of all South African current events. Africa's news leader. The scale of destruction is only becoming apparent as rescuers reach the most affected areas near the border with Mozambique. 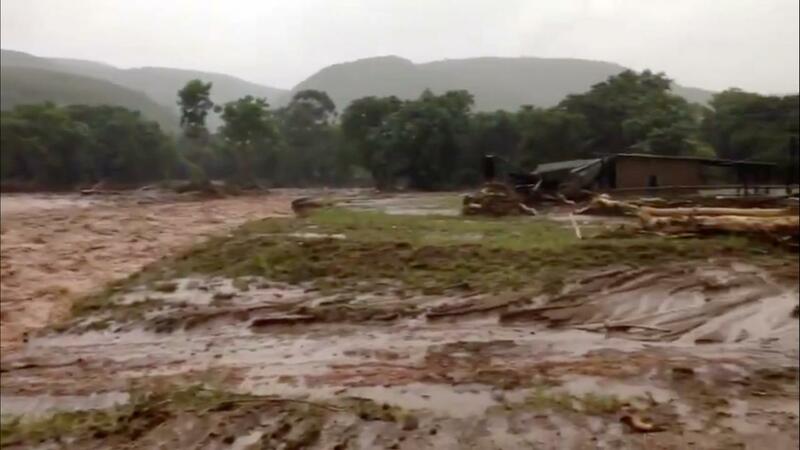 The death toll has risen to 96 in Zimbabwe after Cyclone Idai struck the eastern and the southern parts of the country, creating a humanitarian crisis in a country grappling with serious economic problems and a drought. Chimanimani district has been cut off from the rest of the country by torrential rains and winds of up to 170-kilometres per hour that have swept away homes, roads and bridges and knocked out power and communication lines. Video obtained by news agency Reuters, show people weeping when bodies were recovered from a local church in the aftermath of the cyclone. Local officials say the death toll is expected to rise. Four bridges along a single road that leads from Mutare to Chimanimani have been washed away for the area is actually. They actually have had to use alternative roads and the military are also conducting searchers where they believe a lot of people are marooned. Chimanimani has been hard hit. It also the area where the most number of deaths have been reported. Meanwhile, the United Nations (UN) says it’s working with governments affected by recent natural disasters in Southern Africa and Indonesia. “We issued two separate statements by the SG in which he expressed sadness at the loss of life, destruction of property and displacement of people by tropical cyclone Idai in Zimbabwe and by flash floods, landslides and an earthquake in Indonesia. He extends his condolences to the families of the victims in both tragedies and to the people and government of Zimbabwe and Indonesia. On cyclone Idai our humanitarian colleagues report that in Mozambique widespread damage is reported in Beira City with at least 48 people reportedly killed. In Malawi is has affected more than 183 000 people while 9600 people in Zimbabwe have been impacted due to flooding and landslides. The UN and our humanitarian partners are supporting the government-led relief efforts,” explained the UN Secretary-General’s spokesperson Stephane Dujarric. This entry was posted on 19 Mar 2019,05:32AM at 5:32 AM and is filed under Africa, News, Homepage Featured Story Slider. You can follow any responses to this entry through the RSS 2.0 feed. Both comments and pings are currently closed.